LONG BEACH, Calif. /California Newswire/ — Today, Calif. Governor Edmund G. Brown Jr. signed SB 1383 by Senator Ricardo Lara (D-Bell Gardens), which establishes the nation’s toughest restrictions on destructive super pollutants including black carbon, fluorinated gases and methane. If followed worldwide, these acts would help cut the projected rate of global warming in half by 2050. SB 1383 reduces the emission of super pollutants (also known as short-lived climate pollutants) and promotes renewable gas by requiring a 50 percent reduction in black carbon and 40 percent reduction in methane and hydrofluorocarbon from 2013 levels by 2030. Sources of these super pollutants include petroleum-based transportation fuels, agriculture, waste disposal and synthetic gases used in refrigeration, air conditioning and aerosol products. Super pollutants have more potent heat-trapping effects but remain in the atmosphere for a shorter time than carbon dioxide. Reducing these pollutants can have a more immediate beneficial impact on climate change – and communities. Removing one ton of diesel black carbon from the atmosphere, for example, is equivalent to removing 1,000 to 2,000 tons of carbon dioxide pollution. Worldwide, methane emissions alone are responsible for approximately 20 percent of current global warming. California’s ongoing efforts to improve air quality and address climate change have already led to important reductions in super pollutants, and have provided a strong foundation for today’s legislation. SB 605 by Senator Lara, signed by Governor Brown in 2014, directed the California Air Resources Board to develop a comprehensive strategy for addressing super pollutants, which ultimately included reduction targets now set forth in this legislation. During last year’s Climate Week in New York, the Governor gave remarks at an event hosted by the United Nations Environment Programme, where he outlined goals for cutting super pollutants that are now codified by today’s legislation. One hundred and thirty-five jurisdictions representing 32 countries and six continents, or more than a quarter of the global economy, have signed or endorsed an agreement spearheaded by California to take actions to limit the increase in global average temperature to below 2 degrees Celsius – the warming threshold at which scientists say there will likely be catastrophic climate disruptions. TheseUnder2Coalition signatories seek to achieve these goals through a range of activities including reductions in short-lived climate pollutants like black carbon. Many of the benefits of cutting super pollutants in California will accrue in the most disadvantaged parts of the state, where pollution levels and health impacts are often highest. Every $1 spent on cutting air pollution, particularly super pollutants, creates approximately $30 in public health benefit. While California emits around 1 percent of the world’s greenhouse gases, the state is playing a leading role in broadening collaboration among subnational leaders and reducing climate pollutants. California has cut black carbon emissions by more than 90 percent since the 1960s, has the nation’s strongest standards for limiting methane emissions from landfills and strictly regulates emissions from refrigerants, air conditioning and consumer products. Last October, Governor Brown signed landmark legislation – SB 350 – to double the rate of energy efficiency savings in California buildings and generate half of the state’s electricity from renewable sources by 2030. Governor Brown also committed to reduce today’s petroleum use in cars and trucks by up to 50 percent within the next 15 years; make heating fuels cleaner; reduce the release of methane,black carbon and other potent pollutants across industries; and manage farm and rangelands, forests and wetlands so they can store carbon. In the past year, the Governor has traveled to the United Nations headquarters in New York, the United Nations Climate Change Conference in Paris, the Vatican in Italy and the Climate Summit of the Americas in Toronto, Canada to call on other leaders to join California in the fight against climate change. 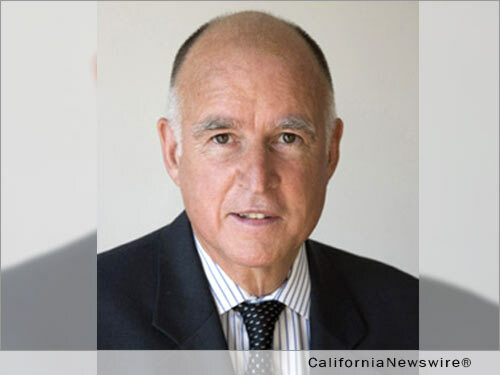 Governor Brown also joined an unprecedented alliance of heads of state, city and state leaders – convened by the World Bank Group and International Monetary Fund – to urge countries and companies around the globe to put a price on carbon. These efforts build on a number of other international climate change agreements with leaders from theCzech Republic, the Netherlands, Mexico, China, North America, Japan, Israel, Peru and Chile and Governor Brown’s efforts to convene hundreds of world-renowned researchers and scientists around agroundbreaking call to action – called the consensus statement – which translates key scientific climate findings from disparate fields into one unified document. Additionally, the Governor issued an executive order last year to reduce greenhouse gas emissions in California 40 percent below 1990 levels by 2030, a goal which is now codified by historic legislation the Governor recently signed that sets the most ambitious greenhouse gas reduction targets in North America. The Governor also signed legislation that directs cap-and-trade funds to greenhouse gas reducing programs which benefit disadvantaged communities, support clean transportation and protect natural ecosystems.